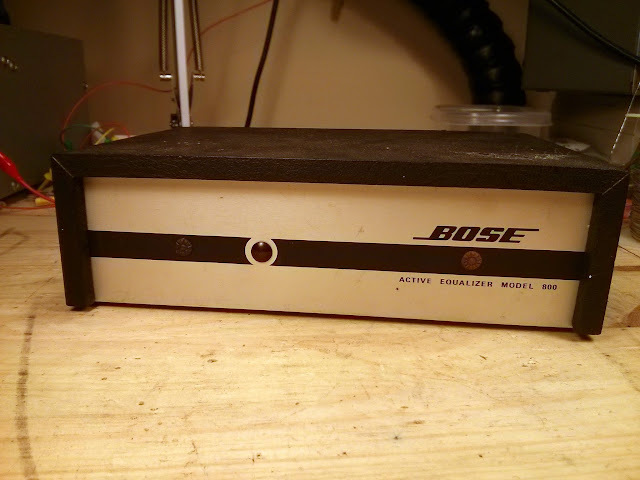 A new one for the shop, I recently worked on a Bose Active Equalizer model 800. This is very similar to the Bose 901 Series II active equalizer; the 800 series were Bose’s PA speaker series from the same model years. They featured the same cabinet design with an iconic “BOSE” grille cover, and the same 8 aligned drivers as the rear side of the 901 series. Unlike the direct/reflecting design of the 901 series, though, these are designed to face forward. 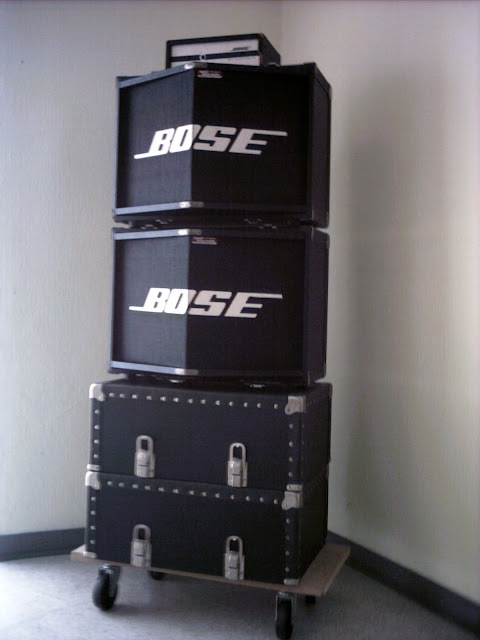 Like the Bose 901 Series II Speakers, the Bose 800 speakers need their Active Equalizer to shape the incoming signal to match the frequency response characteristics of the drivers – and same as their consumer counterparts, the capacitors fail and leak, and resistors drift out of tolerance and need to be replaced. This equalizer came to me with no output from one channel, and a strong buzz over the signal in the other channel – definitely not right. Stage equipment frequently suffers an even harsher duty cycle than consumer gear and wears out that much more quickly. These Model 800 equalizers are rare as a result – I keep a regular eye on sales and postings, and this is only the third one I’ve ever seen. Externally and internally, it resembles a Series II equalizer with no external controls. It has stripped out components which would otherwise have been needed for the adjustments. The curve is slightly different from the 901 series on account of the slightly different driver configuration, but realistically they could be interchanged and you’d probably never notice the difference in practice. Both have a very wide and lively sound stage. Inside nothing looks obviously failed, but most failures of this sort happen without a lot of external evidence – especially in a low power device such as this one. 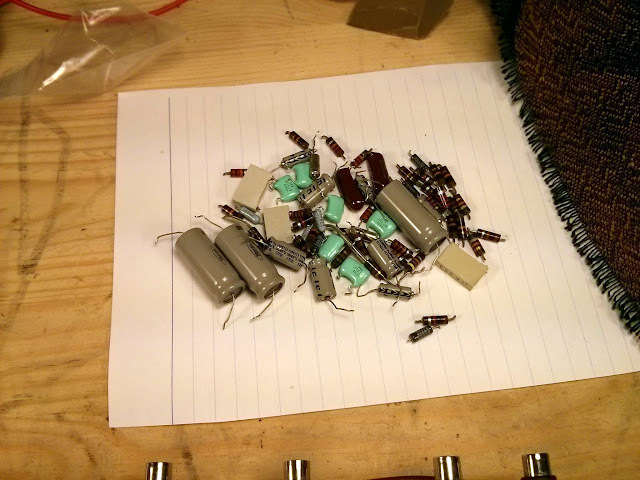 I used all Nichicon capacitors for the electrolytic replacements. 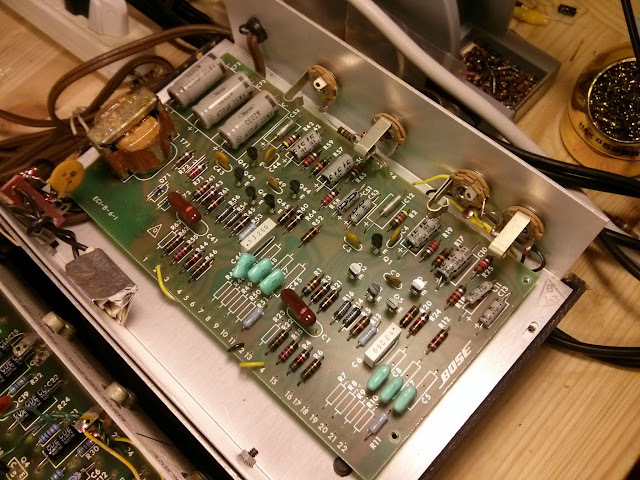 In total I replaced all the resistors and capacitors in this equalizer. After thorough testing with a stereo analyzer and listening on my own set of Bose 901 speakers, this one was ready to go! It will serve for a long time producing the needed signal for a pair of Bose 800 or Bose 901 Series II speakers. 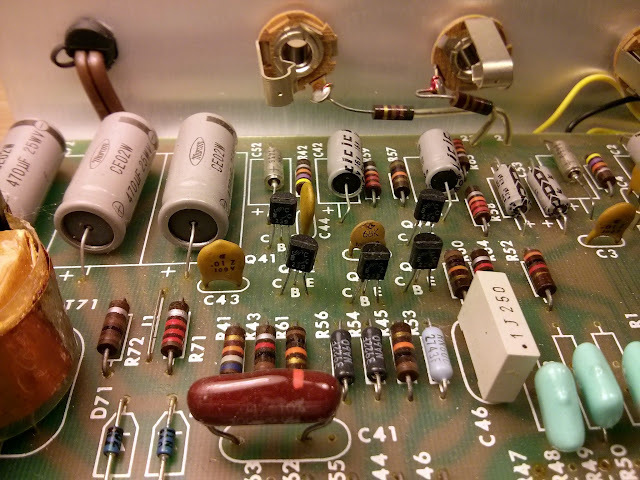 This entry was posted in Audio, Bose, Electronics, Hi-Fi, Projects, Stereo, Vintage and tagged 800, 901, 901 Series II, Active Equalizer, Bose, Bose 800, Bose 901, PA, repair, Speakers, stage, stereo, vintage. Bookmark the permalink. I’ve had those speakers for years, but haven’t used them since i bought an integrated mixer/amp, because I’ve been told that the equalizer was supposed to connected between the mixer and the power amp. You however have pictured the EQ sitting on top of the speakers. So have I been misinformed or what?? Hey Peter, you’re correct – the EQ is installed between the audio source (in this case, your mixer) and the power amplifier. It’s up top just for show in the photo. Bose 800 PA speakers were rated at 8 Ohms, just like 901s, as indicated on all speaker labels I saw. Actually the suppressed front driver was replaced by a 10 Ω power resistor. In addition to the equalizer modifications you described, input impedance was lowered (R1, R41 = 68 kΩ instead of 150 kΩ for 901-II EQs). 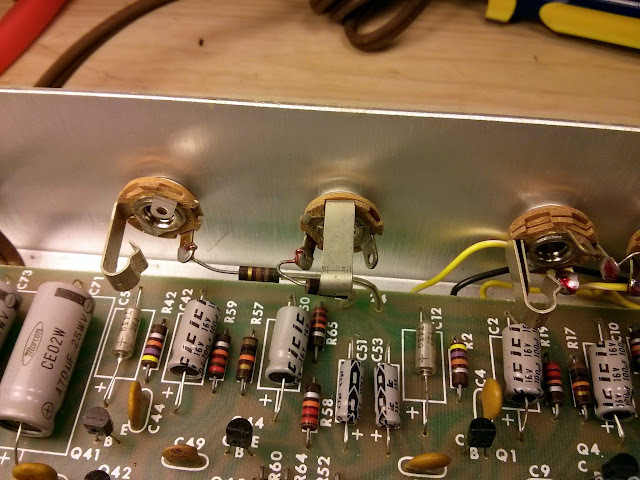 Output impedance was also modified: a 510 Ω resistor was soldered in series between PCB and output jack. Added to the nominal output impedance of 901 equalizers (less than 100 Ω) it matched the old traditional PA transmission line impedance (600 Ω). This resistor can be easily suppressed if this equalizer is hooked-up in a hi-fi set instead of a regular Series I or II equalizer. Hello! They’re in a series/parallel arrangement internally to get 8 Ohms at the speaker. 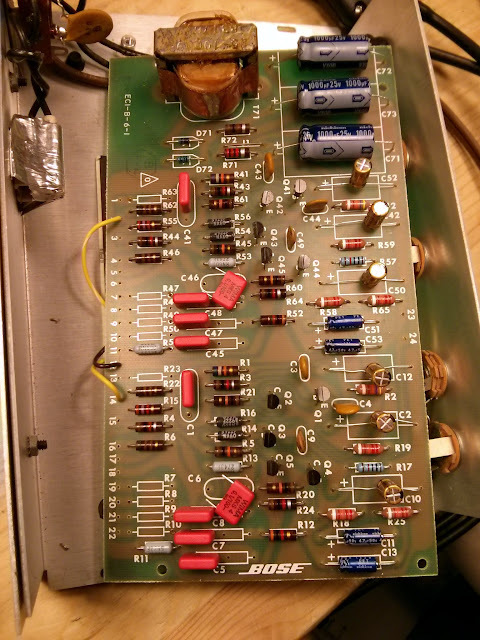 Unfortunately I’ve never been able to find a diagram/schematic for the 800, but the speaker’s wiring is the same as a 901, except one speaker is replaced with a resistor I believe.